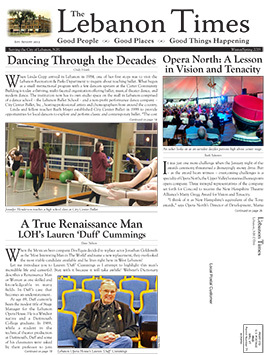 Editor’s Note: The Lebanon Times is delivered to your mailbox each quarter, no subscription or payment necessary. It’s our privilege to bring you all the good news we can. Our mailing sponsor, Mascoma Savings Bank, makes this possible. We’re pleased to have their continued support behind our community newspaper. Nonprofit organizations. Volunteers. Fundraisers. Banks? It may be surprising that one of the most committed nonprofit donors in the Upper Valley is a bank, but for Mascoma Savings Bank, the community is their success to support and celebrate. One of Mascoma’s most cherished events to support is the annual Concerts for the Cause series, which provides funding for Child and Family Services, a statewide nonprofit agency with a regional office in West Lebanon. Mascoma has been active with Concerts for the Cause for more than a decade. Child and Family Services, corporate sponsors, and ticket patrons have been coming together since 1985 to host annual Concerts for the Cause at the Lebanon Opera House and around the state. Past performers have included well-known artists like Grace Potter & the Nocturnals, Arlo Guthrie, Blues Traveler, Preservation Hall Jazz Band, Taj Mahal, Cowboy Junkies, Don McLean, Randy Newman, Joan Osborne, Robert Cray, and more. Proceeds support child abuse prevention, intervention and treatment, foster care, home-based family strengthening services, mental health counseling, runaway and homeless youth outreach and survival aid, parent education and support, early childhood development services, healthy families home visiting to ensure babies get off to a good start in life, positive youth development programs, transitional and independent living, child advocacy, and summer camp for children from low income families. For more information on Child and Family Services and the Concerts for the Cause, visit cfsnh.org.